Can we choose our emotions? What, if any degree of mastery can we establish over what we feel? How would that change our life and society if we were more frequently able to calibrate our emotions so that the played constructive roles rather than governed behaviors such as overreactions and escalating cycles of disproportionate responses? Why is it we clearly see the value of encouraging people to practice things like – how to pronounce words, play an instrument, and so on as part of the learning process, but we rarely, if ever, focus on teaching the skill sets to get a cognitive grip on our emotional state? In fact, we live in a reactionary society that punishes a the behavioral results of a lack of emotional control at the same time we do little to prevent these situations from arising in the first place. Emotions are like the bladder. We can learn a measure of control when and where we express them. Of course no measure of discipline can overwhelm the ultimate physics of the situation, but the point is, we have established social norms and the corresponding physical disciplines so that we as a society, don’t piss willy-nilly at the drop of a hat. Further; we have not given the same level of attention to the destructive consequences the result from the loss of emotional bladder control. While there are some generally vague social cues that signal what emotions are appropriate for what situation; largely speaking, the way we typically mediate emotional expression is crude an ineffective as a foundation for crafting an intentional life and a more nourishing social behavioral profile. The crux of this is the idea that if we were to craft the disciplines of emotional control and implement them sufficiently across our social landscape, we would then have much more capacity to respond constructively to situations, or at least minimize the damage that happens in the wake of emotions gone wild. This observation is not meant to suggest that developing and implementing these techniques would usher in some utopian hug fest, nor is it meant to imply that this is the only way to address the issue. Obvious circumstances exist where we know certain segments of society are, in effect, emotional pressure cookers that are fertile fields for preventative actions, rather than developing the social structures to mitigate the aftermath of that neglect to prevent. This is meant as a pointer to significant missed opportunity for something so easily identifiable and potentially powerful as a means of forming stronger bonds of social unity among us. We humans have precious little capacity to use logic and sound reason as a steering mechanism to guide our lives. We must leverage our meager capacity to the fullest if we are to have any realistic hope to cope with the age we live in, where we can do so much more with so much less both constructively and destructively. As it stands, our capacity to apply theory breaks down the moment our emotional hackles are raised and we transform into wild eyed banshees dipping our fangs and claws into each others flesh that would be better handled with appropriately measured responses. We leave many scorched earth relationship landscapes in the wake of our lack of emotional bladder control. 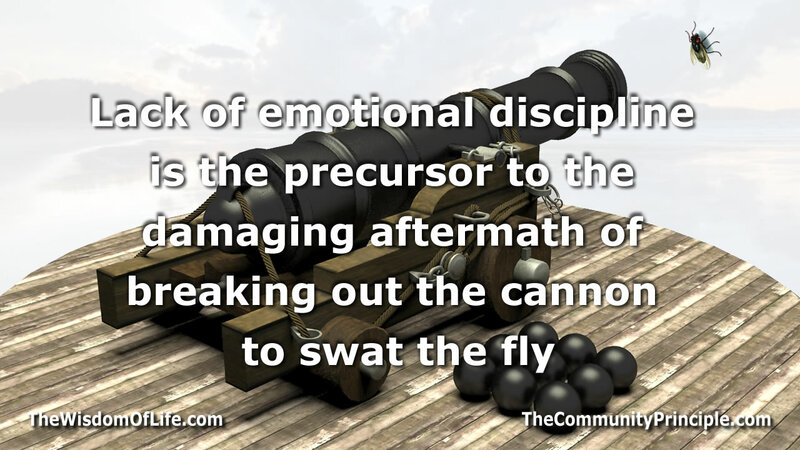 These might otherwise be avoided if those of us concerned with crafting a more constructive social landscape were focused on developing the techniques for, raising awareness of, and implementing the skills to spread the notion and the discipline of the value of situational emotional calibration – so that we are less likely to be subject to the damaging aftermath of breaking out the cannon to swat the fly. An article July 27th 2015 in the Indiana Times identified a factory in China that is automated to the point where all the processes are operated by computer-controlled robots, numerical control machining equipment, unmanned transport trucks and automated warehouse equipment. This sparks the question; How are we going to value human contributions once machines are able to perform all the tasks? Are we ready to face these transformative issues that are on our near term horizon as a species?